As you get everything moved into your new home, it is the perfect time to meet your new neighbors! Whether you are moving in from out of state or just moving a few neighborhoods down, getting to know your neighbors will help make your house feel more like home. Extraverts, introverts, homebodies and social butterflies, there are many different ways to introduce yourselves to your neighbors. Here are 7 ways to help break the ice. 1. ASK QUESTIONS – If you are new to the area, neighbors are the perfect people to ask questions about the area. Where are the best restaurants? Fun things to do in the area? Best doctors/dentists/vets/etc? They are a great source for everything local, and asking questions is a great excuse to introduce yourself! 2. SPEND MORE TIME OUTSIDE – Use your yard, balcony, or front porch. Pull up a chair and catch up on a book or magazine while enjoying a nice cold drink. Sitting in the front of your home makes you look open to meeting people and naturally leads to conversations with those passing by. 3. BAKE TREATS – This may gear more towards our extraverts, but make some cookies or fresh baked treats and bring them over to your neighbor’s house to say hello. They will love the treats and enjoy meeting you! 4. PLAY DATES – For those with children, they are a great way to meet others in the neighborhood that have children as well. If it is during the winter when less people are outside, perhaps your son and/or daughter will meet them at school! Schedule play dates with a few families in the neighborhood. It is a great opportunity to meet them and form a relationship. 5. PETS – Who doesn’t love our furry little friends?! Take your dog for a walk around the block! Your pup will get his exercise and chances are someone will ask about your dog and will start a conversation. If not, people you pass will appreciate a simple wave and hello too! 6. 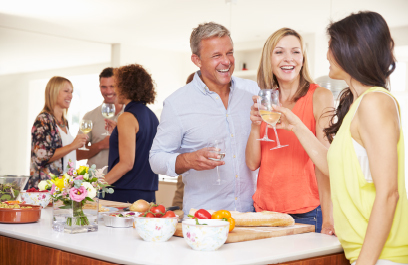 PARTY – Host a bonfire or cocktail party at your house and invite your neighbors. No food prep necessary, just grab some snacks and beverages and enjoy a fun night chatting with those around you. Remember, these people are your neighbors for the foreseeable future, so after your bonfire or cocktail party there will be plenty more opportunities to build on those relationships! 7. ONLINE – If you are more of a introvert or are feeling overwhelmed with your move, maybe it is easier for you to say hello via Facebook. Some communities have a private Facebook page you can post on introducing yourselves, and if not, maybe you can start the private group! It is a great way for everyone to communicate within the neighborhood and stay up to date on all things and events near the community. Remember, odds are your neighbors are just as eager to meet you as you are to meet them, so don’t be afraid to strike up a conversation! If you are in search of your new home, check out our communities to find a place for your new home. We also build on-your-lot in the south metro of the Twin Cities.